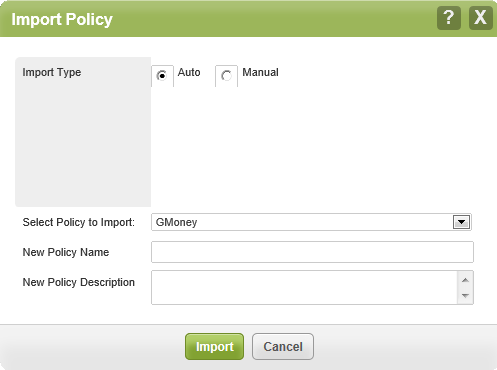 Within the policies panel at both Site and Global Site Manager (GSM) level, you can now import policies. This reduces the maintenance overhead for Endpoint Protection administrators, since they no longer have to manually recreate identical policies across multiple sites. Instead, they create a policy once, then import the policy into all sites where the policy is needed. This is also useful at GSM level, since the GSM Super Admin can import a site level policy into the GSM console, make it global, and then make it available across all sites with global policies enabled. From the Site console, click Global Settings. The system displays the Global Settings panel, with the Policies panel active. 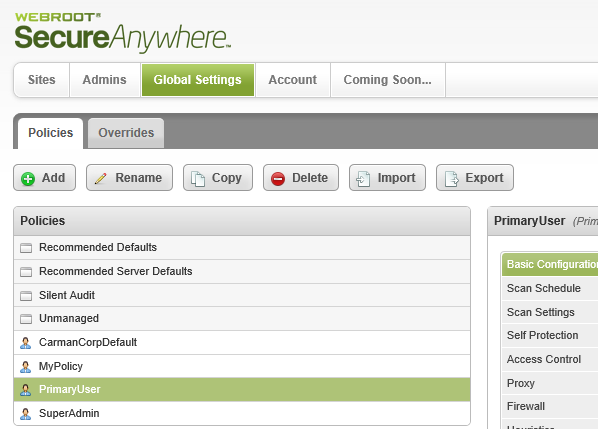 The Policies panel displays a list of all policies across all sites to which the logged on account has access. 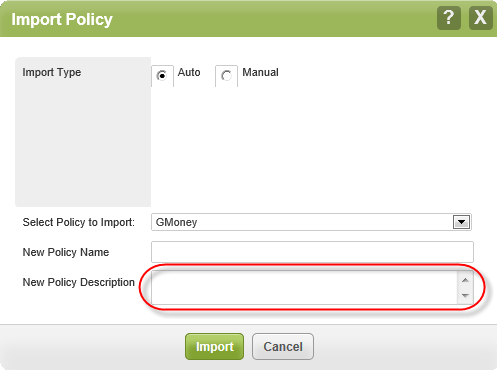 In the Policies area, select the policy you want to import from the list. The system displays the Import Policy window. In the Import Type area, select the Auto radio button. From the Select Policy to Import drop-down menu, select the policy you want to import. In the New Policy Name field, enter a name for the imported policy. This step is optional. In the New Policy Description field, enter a description for the imported policy. This step is optional. When you're done, click Import. The system transfers the policy into your current console.